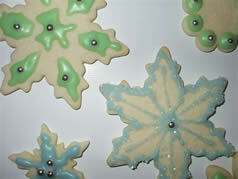 Choose from a variety of coloured frostings and sugars to create your own Martha Stewart-inspired cookies. •	Mess up my kitchen – not yours! •	Cost $30.00 per person includes one dozen cookies and appetizers. Additional dozen $15.00 per dozen. Ample notice, reservations and prepayment required. Call 519 353 7470 or email micheline@mannmadestudios.com to reserve a date for you and your group of up to 10 adults (16 and older).